The JOOLA Midsize Table Tennis Table is perfect for anyone who loves table tennis but is tight on space. The table stands at regulation height (30 inches) with a surface that is 2/3rds (72 inches) the length of a regulation-sized table. Each half of the table is a near perfect square and can stand alone, perfect for card games or any of your other multi-use table needs. With the JOOLA Midsize Table you can now play table tennis no matter where you live and no matter how much space you have! The foldable halves can be stored in most standard sized closets, so after playing you can reserve space when needed. The JOOLA Midsize Table requires no assembly. Simply unfold each half’s legs, attach the net and you’re ready to play! 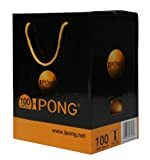 The iPong Table Tennis Ball Set is a box of 100 orange 40mm training balls. These 2-Star quality balls are ideal for training solo with the iPong Table Tennis Trainer, practicing serves, or playing with friends. The balls are packaged in a box designed to be repurposed into a ball carrying case for training sessions on the go. Note: Most standard iPong robots hold up to 110 balls.